Thinking of a particular e-mail marketing strategy? Well, that is probably a very good idea then because nowadays, emails are the new champions in the business world. Don’t believe us? Well, we have proof to back up our talks people. These statistics below will make you believe that with the help of an e-mail marketing strategy or many email-marketing strategies, you will be able to boost up the sales of your products in an efficient and effective way. So, let’s get on with the necessary, shall we? It’s estimated that around 34% of the world’s population has been using email. This number denotes roughly around 2.5 billion users. However, the stats might increase to a number of 2.8 million users in the next couple of years. Yes, of course, email is more popular than you think. A survey has been made which tells that about 196 billion emails are sent every day out of which 109 emails are business related. 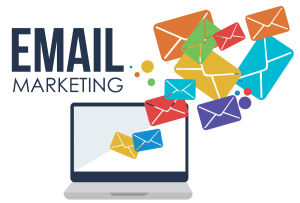 Simplifying it, we can say that Email marketing is one of the powerful and vibrant ways to stay connected with people. Nowadays, you hardly know someone who doesn’t have any email address. You receive a number HTML emails every week. Emails play a big part in our lives. If you are a businessman then Email marketing can be the best way to reach the number of customer goals that you have set. The messages from your family and friends lie in the same folder of the email updates of your company. This is the reason email marketing becomes the best way for marketing when you personalize it. You can tailor the emails depending on the action of your customer so that each communication can become relevant to them. You can ask them about changes in your company, feedback about the company, victories and many more. If you still think Email marketing is not doing any good to your company then below here are few reasons which will tell you about why such marketing is important. Don’t take the reason in a wrong way. We all know social media is a very big platform and the significant component of any marketing strategy of a business. Social media is one of the best platforms to interact with your peers and establish a stronger relationship with them. And due to this reason, it is significant that you should take the first step to reach your goal by converting them into members. But when you have to convert them to customers, email marketing is the way you can do it. Email marketing is very easy and inexpensive. With the help of email marketing, you can reach a massive number of customers and the rate of per messages to the customers nearly stands for nothing. For a small business who wants to do business on a budget, Doing Email marketing For Business is the best way for him. This will do a better business for him than the traditional marketing like the TV, radio etc. Comparing the email marketing with the traditional marketing efforts where you have to post and print the images which might take a lot of time and money as well whereas in Email marketing you can create the same images. But in email marketing along with the images, you can add the benefits of follow up which will take your customers directly to your website. Not all customers are same in the business, so, In Email marketing, you can categorize your customer accordingly and put them in the list. Now you can send messages related to their interest in each list. In this way, you can provide value to your customer. While writing a post on the social media platform you address the audience as a whole but this is not in case of Email marketing. With the help of Email marketing software, you can send messages to each of your addressing their name. As mentioned different customers have different requirements, so, you can split your topic for the customers which will be of their interest. So, the above-mentioned facts tell you about why and how email marketing is important. If you own any business then start with few steps and see the magic email marketing in your business. Nowadays, setting up and managing an e-commerce business is certainly not a child’s play. We mean, there is so much competition in the market that there might be a chance that your business doesn’t even get to see the light of success. We at MLveda, follow these techniques to improve our sales and we suggest you to start implementing for your business as well. Worry not, as with the help of these fantastic strategies and techniques; you will be able to boost up the product sales of your business. If you don’t already know how people in the world respond to the emails that are mass broadcasted, then you clearly have been living in a different era, my friend. Try sending a mass broadcast mail to your customers and you will automatically find yourself marked as spam. Some might even go ahead and delete your mail without reading it. For a proper sales pitch for your business, there is only one option to get the attention of the readers. Email personalization. There is a much higher chance that you will get a response to the emails that are personalized. What is the reason behind that you ask? Well, the readers of today want to buy the stuff that they are actually interested in. Personalized emails will give them the idea about that. So try it out, people. According to the research done by the Baynard Institute, the average rate of online shopping cart abandonment is about 68.63%. This percentage almost amounts to $4 trillion. When it comes to the number, It can be said that there is a major loss in the revenues and the sales for the different e-commerce business sites. So, what do you think is the solution do that? Well, cart abandonment is definitely considered as a bad thing. But, what if you could turn the tables with the help of email marketing? Using this strategy, you will be able to bring the customers back to the website. All you have to do is remind those customers via emails about their abandoned carts. There are chances that a particular e-commerce business site will probably run out of the stock in the areas and certain ranges of products. The products might be of a perishable nature or might be out of stock because someone else bought a bulk of them. There comes a time when certain products are just not available for selling. In many cases, it so happens that the customer is interested in re-ordering the particular item after some time. This is the time when you should use the e-marketing to let them know how long the product will be available. Stock notification emails are mostly indicators that you care about the customer demands. This can be a great way of boosting the sales of your business. Always keep this in mind; you don’t need to push the products into the face of the customers in your emails. You could subtly bring in the topic with the help of some engaging and contextual content instead of doing that. Online shoppers and customers have a lot of doubts and questions regarding any e-commerce websites. So, this is something that you could tap into when sending an email. Contextual and meaningful content will eventually make the customers more interested in your emails. Don’t just push up the product, lead them to it and give them the details about it first. In that way, you will see that they will get more interested. This is something that we all know. In the world of online business, consumers will have faith on other consumers. There have been many cases where the customers just need to have a final assuring push before they finalize their decision of buying any product. During this time, you could make sure that there is some sort of social proof in your emails and also the website to lead the customer. This will eventually boost up the product sales. So, what is this proof? Well, it could be the statement of the customers who have already used the product and found it amazing. This can be a great way to get more customers. It is estimated that the transactional emails rate is almost 10 times as much as the bulk email rates in businesses. Also, the CTR rate of these transactional emails is basically higher as well, when compared to the other emails. So, this can be something that helps to increase the product sales of a business. Optimizing the transactional emails will be a fantastic opportunity to make sure that your products are sold in a better way. When sending a particular confirmation email, you need to send the details about the other products that could prove as a compliment to the purchased order. Doesn’t that sound like a good idea? One of the major challenges that the e-commerce businesses face after acquiring the customer is to keep the customer. Customer retention is no easy task people. You will always have a competitor that is ready to provide better deals and more offers to the customers. As a result, you lose your loyal customers. E-mail marketing can help in that and the best part is that you won’t even have to lower the prices. Sending emails about rewards and loyalty programs helps a great deal in increasing the purchase frequency. You will eventually end up have fantastic product sales. There has been a vast expansion of the e-commerce industry and if you want to keep your business that finding tactics of engaging the customers is the only option that you have. These rates of customer engagement will directly affect the sales of your business. With a platform like an email marketing, you will be able to interact, acquire and retain the customers and thus increase your product sales.